Thank you for visiting our registry! We can't wait to see you at our showers in July and/or August! 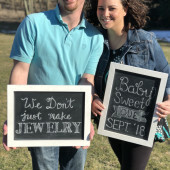 We are SO excited for Baby Sweet and can't wait for you to meet him!